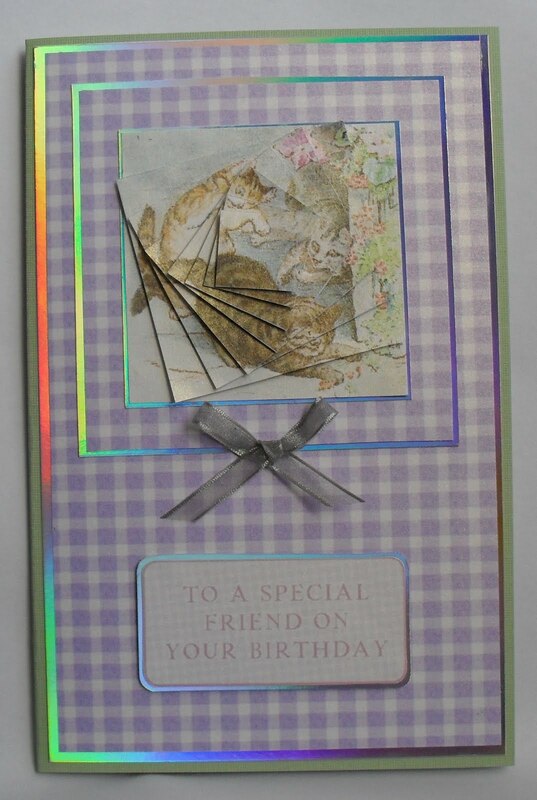 This card is for a friends daughter, she is 8 today. All the backing papers are from the Mrs Tiggy-Winkle CD and the image is from the Tom Kitten CD from Crafter's Companion, ribbon from C & C TV. Nice and simple today everything edged with silver mirror card from stash (I always cut the middle from the mirror card when layering so it can be used for some thing else. I hope everyone is having a nice weekend and for all those who manage to get to the NEC (lucky people) I hope you didn't break the bank. Hiya Poppet. This is beautiful and so delicate. Love the colours. Please visit my blog, there is someting there for you. Lovely card poppet. Thats a great idea with the mirror card, I hate to use a whole sheet so now I know what to do. Thanks! Great card love the mirror paper - never went to NEC and still broke!